If luxury living and an effortless lifestyle is your passion, then focus your attention on THIS beauty. 2017 build and AS NEW. 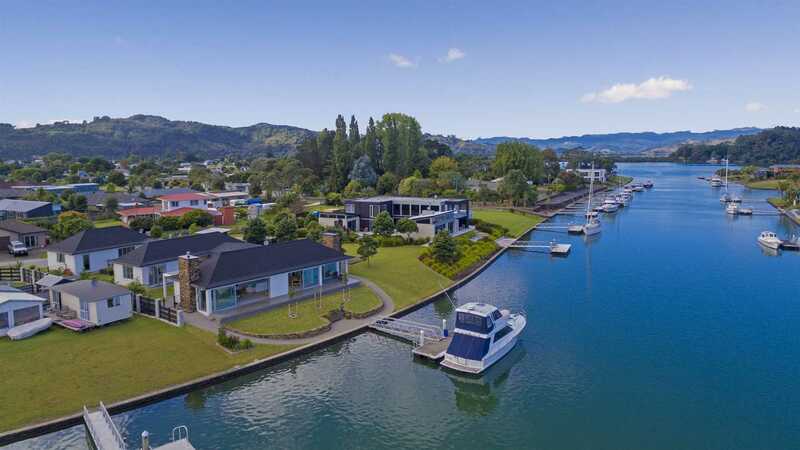 With a very generous sized section of 1,255 m2 (mol) this amazing canal front home is complete with a large pontoon to be enjoyed, right at your boundary. In a prime position for sunshine and canal views a special feature of this home is a guest wing with lounge (plus gas fire), fully tiled bathroom and spacious bedroom. This wing can be closed off from the remainder of the home, perfect for guests or possibly a B and B? Triple vehicle garaging, concrete pad for extra parking, wash down facilities and manicured grounds - this property must, in our opinion, be one of the best in position and quality in today's market. Luxury and comfort, space and sunshine plus all the bells and whistles are right here. Please ask for our Information Flyer for full detail. The living areas are all open and spacious with quality fittings and fixtures designed with comfort in mind. A large gas fire also in the lounge area. There's a well placed Butler's Pantry off the kitchen which is dual purpose, serving a partially covered, sheltered barbecue area for ideal easy outdoor entertaining. The master bedroom overlooks the canal and has a large ensuite, fully tiled and as with the other bathrooms, has underfloor heating. A further two bedrooms, large tiled main bathroom and separate laundry make up the remainder of the home, generous storage throughout. A well planned spacious floor area all on an easy single level gives excellent indoor-outdoor flow for ease in all weathers. Chattels remaining Fixed floor coverings, Light fittings, Drapes + 3 x Remotes Lounge & Main Bedroom, Blinds + Battery & Electric Conrol, 2 x Separate Wall Ovens, Sky Dish, Fridge/Freezer, Microwave, 2 x Wall Mounted TV's, 2 x Escea Gas Fires + Remotes, Outdoor Louvres + 1 Remote, Tilta Bed, TV & Fridge in Guest Wing, Washing Machine & Dryer.